Who makes the best potato latkes in Manhattan? As much as I hate to admit it, I’m thinking of “outsourcing” the latkes for my family’s Hanukkah gathering this year. My daughter, who lives in the LES, will be coming here to PA and can do the shopping for me. The only latkes she’s familiar with that she really likes are those from Veselka, but she’s willing to do a taste test to find worthy candidates. I like them crisp, onion-y and on the small side. So, who makes the best latkes in town? Ukrainian East Village makes latkes that are excellent, except that they are saltier than I prefer. But otherwise, they definitely meet your specifications. Thanks, Pan. I’ve sent my daughter on a tasting mission that includes Ukranian National, B & H Dairy Restaurant and Russ & Daughters. 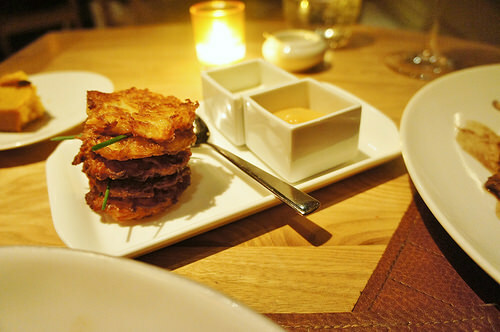 Park Avenue Autumn (Winter, Spring, Summer) serves potato latkes as a side dish. They’ve become something of a signature. Utterly delicious! I would suggest calling the restaurant to see if they would accommodate your needs.